These three albums all signify that Guild's Light Music series is now the one to follow for lovers of this genre. The imaginative covers, profusely detailed notes and the high standard of recordings are truly a joy to behold and these discs are no exception. 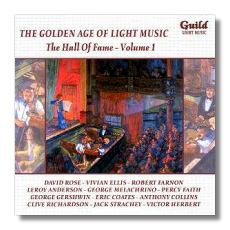 'The Hall of Fame – Volume 1" includes a new innovative concept of a featured composer which in this case is Clive Richardson with the London Fantasia particularly enticing. Other items of interest include Stanford Robinson's 'In A Persian Market' by Ketelbey, 'Portrait of a Flirt' by Robert Farnon and the final movement from the 'Four Centuries' Suite by Eric Coates. 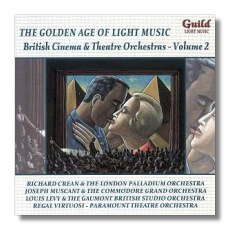 The second volume of British Cinema and Theatre Orchestras also includes some interesting items. Pride of place must go to the 'Three Bears' Fantasy by Eric Coates or Ernest Bucalossi's 'Grasshopper's Dance'. Elgar's 'Salut d'Amor' is hauntingly beautiful in Anton's interpretation whilst an original touch may be found in Thurban's 'Yankiana' – American Suite whilst the concluding 'Aunt Sally' selection also gives one something to shout about. 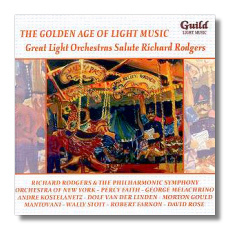 Finally, there is a just tribute to the legendary Richard Rodgers with a huge number of legendary light orchestras. The classics such as the 'Carousel Waltz', 'Song of the High Seas', 'March of the Siamese Children', 'Guadalcanal March' and the concluding Richard Rodgers Suite all bring a lump to the throat as those famous melodies come to life in these long lost interpretations. Amongst the famous orchestra conductors are Louis Levy, Stanley Black, Morton Gould, Robert Russell Bennett and the great man Rodgers himself. I really cannot translate this music into words but the whole feeling of the occasion is a magical experience. All three CDs are profusely annotated by the indefatigable David Ades and we have now reached the 23rd issue in this magnificent Light Music series. You cannot afford to miss these issues which bring a sense of joy to any moment in life.